10,000 Books Weblog : Minnesota Historical Society Press » Boo! ‘ Tis the season for ghosts and goblins, and our fair state has no shortage of boogeymen. MinnPost’s Max Sparber ponders the ghosts of the Washington Avenue Bridge and the “Supernatural Minnesota” series by Thomas M. Disch, recently reprinted by the University of Minnesota Press. The Businessman is the first book in the series. 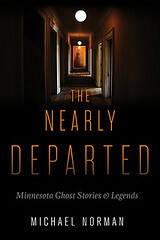 The Minnesota Road Guide to Haunted Locations by Chad Lewis offers info on where to sleep in a haunted bed-and-breakfast or have a drink in a haunted pub. Tonight and tomorrow at the Mill City Museum’s The Minneapolis Horror: Tales from the Night Shift you can learn about the horrific disasters that have befallen the mill and its workers over the years. Shadows and Spirits of the State Capitol, Thursday through Saturday, offers visitors a chance to see historical “spirits” who tell stories of the capitol’s early history. Or listen to dramatic readings of Victorian Ghost Stories in the dimly lit James J. Hill House parlor on Sunday night.